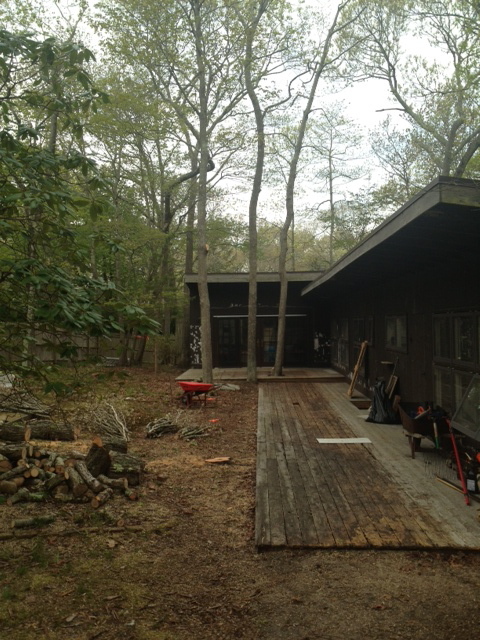 STEAMING TOWARD A MOVE-IN DATE of this Friday at my new/old house in East Hampton, N.Y. Yes, I know it doesn’t look move-in ready, and the fact is, I still don’t have water. But that’s my goal. The phantom plumber was supposed to come yesterday to hook up a couple of fairly important items, including a toilet, but he was sick. Fingers crossed for today. I had two satisfyingly productive days recently. 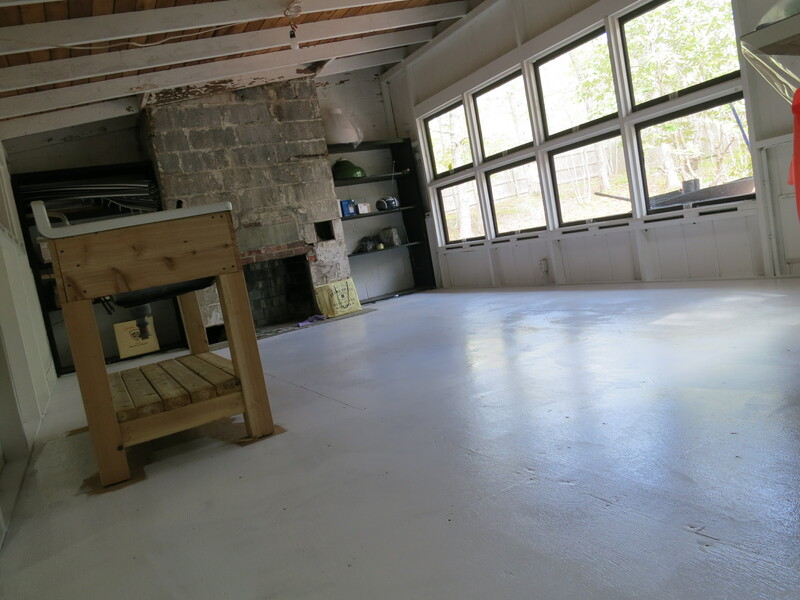 On Sunday afternoon, I put a coat of primer on the plywood floor in the dining/sitting room, above and below, soon to be covered by floor paint, probably white. Quick way to make the place feel cleaner and brighter. This first required the painstaking removal of hundreds of carpet staples, most with tufts of carpet stuck to them, a prospect that had been hanging me up for weeks. My daughter got to it last week with a pair of pliers, enabling the operation to proceed, and for that I am very grateful. I spent almost all day Monday cleaning the house as best I could without H2O. That was a rather non-green operation involving broom and dustpan, the vac, Swiffers both dry and wet, spray cleaner, and lots and lots of paper towels. I won’t be happy until I get my rubber gloves into a bucket of hot soapy water, but it helped. 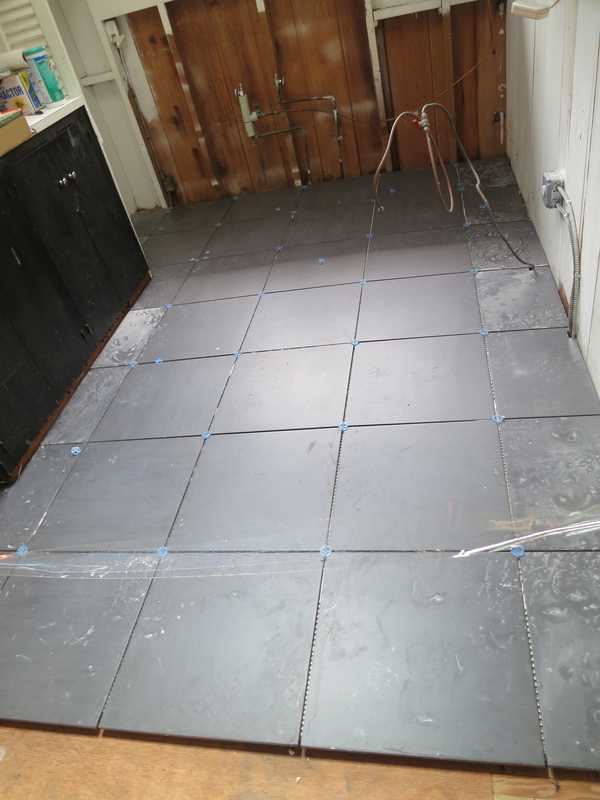 The kitchen floor, below — 18″x18″ charcoal gray tiles — has been laid and will be grouted today. The stove and fridge are being delivered later this week. 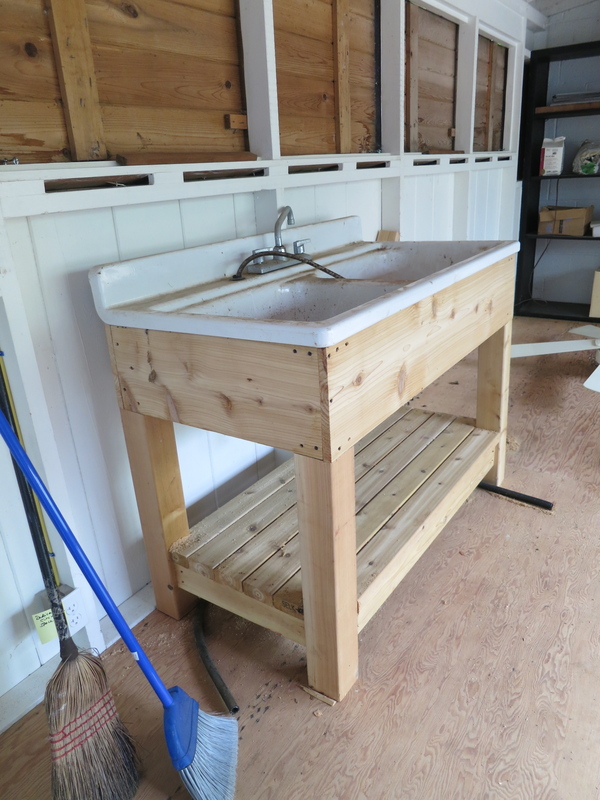 The contractor built a wooden base for a deep two-basin kitchen sink top that was left behind in the shed, below, following a magazine picture I showed him. I think it came out better than the picture. Then I’ll have to say goodbye to all my helpers for a while and forge on alone for the next couple of months. 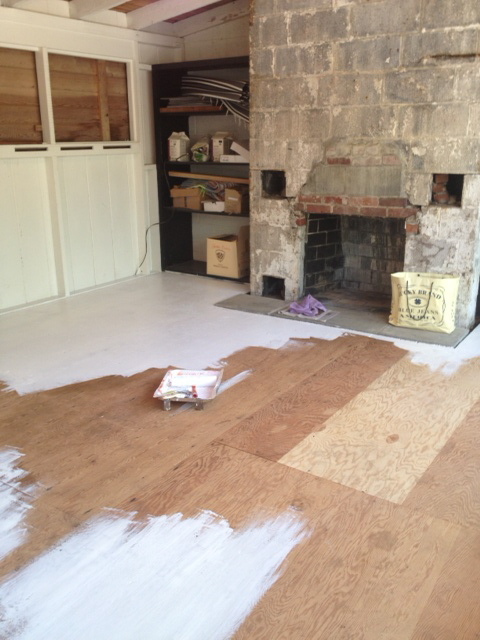 The coffers have run dry, and all incoming funds will be going toward fix-ups at our mews house in Brooklyn. <–That link is to a four-year-old post; the rent has gone up. If interested, contact me at caramia447@gmail. The longtime renters are leaving, and the place requires attention and an infusion of cash. By the way, anyone need a 9-1/2 foot long liquid propane tank, bottom? Once used to heat a now-disappeared swimming pool, it sits in the parking area like a beached submarine. I got a $4,000 estimate to take it away, so it won’t be leaving any time soon. It’s not in my way, but neither do I anticipate any future use for it. Do I have any takers? This entry was posted in HAMPTONS, LONG ISLAND, RENOVATION and tagged arborist, Cobble Hill, East Hampton, for rent, house cleaning, housecleaning, kitchen floor, kitchen sink base, liquid propane tank, low-budget, mews house, plumber, shoestring, Springs, townhouse, tree removal, wood. Bookmark the permalink. Let’s paint it to really look like a submarine. Or, perhaps yellow! And maybe an undersea scene painted on the stockade fence……..
Do the Holly Golightly, get a welder to turn the tank into a sofa, + few holes to drain, cushions, bobcat to move it into place. If cut correctly perhaps a pair of sofas!!! LOL, really. The last thing I expected to see in the posts. What a great idea. 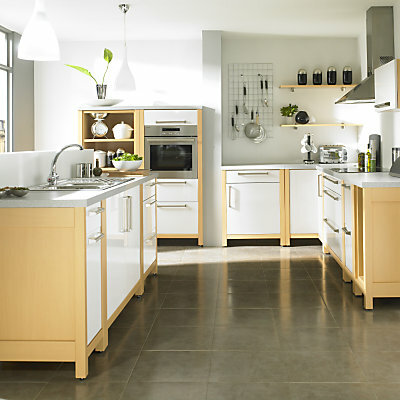 That kitchen tile is VERY similar to the one I had, but the tiles look slightly bigger. Color about the same. It wore well and looked great in my place. Your progress is already substantial. Hope you get in at the end of the week. It’s time to be near the beach. Glad to see you made a decision on the tile. I think you’ll like the lighter tile, too. It looks good. Have you tried calling Pulver Gas or Schenk (sp) to see if they want it? I paid Pulver quite a bit for it years ago. Also, have you given any thought to what you plan to use for heating fuel? Sad to see the tree near the house gone. It was tilted in a hurricane many years ago, and was in no danger of falling over. Ah well, it’s your place now, but I had great affection for the many trees. Great progress, Cara! Love that sink base. As always, amazed at your physical energy and your do it yourself spirit! Craig, it’s all a monopoly now. Schenck no longer sells liquid propane, Pulver has been absorbed into Suburban, and Suburban doesn’t want the tank. It was they who gave me the number of Windmill Environmental who wanted $4k to remove it. Have not decided about heating, but even if I did heat with propane, the house would not require that large a tank. Jack, how do you propose I “get it” to a scrap yard? I’m pretty sure it won’t fit in the back of my Honda. I have placed a call and will let you know what comes of it. Love the white floors (keep a hand vac handy) and the charcoal tiles in the kitchen looks fab. I just made similar choices and am happy to share paint color selections with you when you are ready. That’s one gigantic tank–maybe a neighbor w a pool would like yours and would be willing to pick it up n/c.